This is an opportunity for high school teams consisting of two individuals to propose a solution to an ethical dilemma in front of a panel of judges. Specific questions about the High School Ethics Case Competition can be directed to Tim Switzer at: tswitze@clemson.edu or by calling (864) 656-5379. The Rutland Institute for Ethics sponsors Lunch 'n Learn Forums throughout the academic year. Designed for students and/or faculty/staff, the discussion forums focus on relevant issues that can potentially challenge ethical decision-making efforts. The purpose of these sessions is to raise ethical decision-making awareness on the Clemson University campus, and to encourage critical thinking skills among students. The next Lunch ‘n Learn Ethics Forum is entitled, “Cheating: Let Me Count the Ways,” and will be held on Tuesday, March 5, 2019 in the Clemson Student Senate Chambers. Beginning with free pizza and brownies at noon, an engaged, interactive program for students, faculty, and staff will be offered 12:30-1:45 pm. Specific questions about the Ethics Lunch 'n Learn Forums can be directed to Kathy Russ at: kruss@clemson.edu or by calling (864) 656-1416. 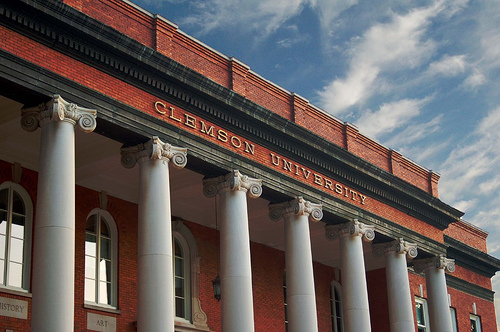 Each October, Clemson University celebrates its Annual Ethics Day throughout campus. The next Ethics Day is scheduled for Wednesday, October 16, 2019. Sponsored by the Rutland Institute for Ethics (RIE), this event is an opportunity to remind students, staff, and faculty members about the importance of ethical decision-making in their personal and professional lives. The institute has also launched a comprehensive decision-making model officially endorsed by the university. One of the key components of the Rutland Institute's mission is to provide a decision-making model so that our students will have something to refer to when help is needed. With the help of Philosophy Department Professor Daniel Wueste, we’ve been able to identify a decision-making model that can impact every person associated with Clemson University. Should you have questions about institute activities and initiatives and/or wish to support the institute's mission, please contact Dr. McCoy at wmccoy@clemson.edu. The FACE Committee exists to strengthen the foundation of ethics education throughout Clemson University by ensuring opportunities for curricular and co-curricular integration of ethics throughout the breadth and length of the university. For more information on the FACE Committee, please contact Dr. McCoy at wmccoy@clemson.edu or (864) 656-6147. CHANGE is a newly-formed student ethics group in the process of becoming an officially-recognized student organization on campus. Their mission is to inform and educate students of Clemson University about the importance of ethical decision-making while encouraging them to act as ethical leaders in their respective fields. Among its activities, CHANGE is the student voice to the Rutland Institute for Ethics, assists in supporting and preparing for Annual Ethics Day, assists in supporting and preparing for the High School Ethics Case Competition, creates the Ethics Editorial bi-annual newsletter, and establishes programming at both the University-wide and College-specific levels. For more information or to inquire about joining, please contact CHANGE's president, Tim Switzer, at tswitze@clemson.edu or (864) 656-5379.